And here is the same area softened up with vintage fabrics. 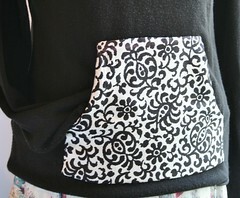 The inspiration came from an old hand embroidered laundry bag that I have had for close to 20 years. At one time I had it hanging up on my bedroom wall just because I thought it was kind of neat. Later it was relegated to the fabric stash because I just did not know what to do with it. 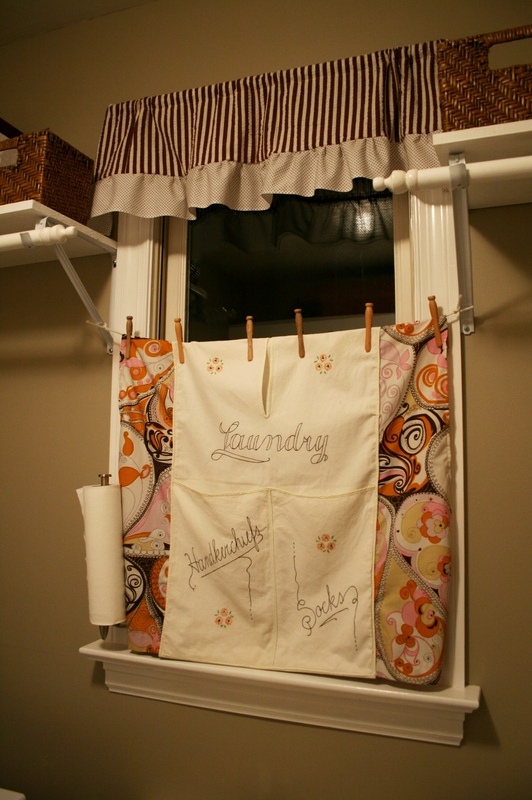 A few months ago it occurred to me that the skinny little window in our laundry room would be the perfect spot to hang this old laundry bag. This window is also very sunny and although I enjoy the light when I am knee-deep in dirty clothes, sometimes it literally blinds me as I am trying to move around the space. So, even though I did not want to block my view to the back yard, I knew I had to make this area comfortable to work in. 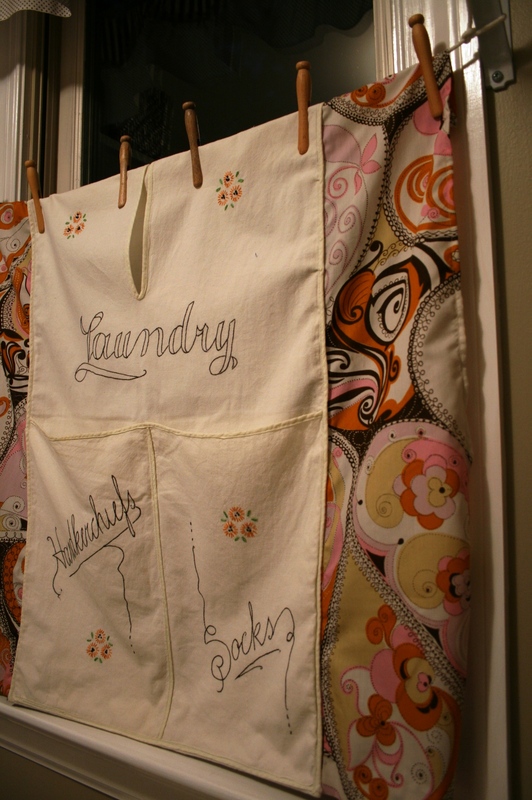 The vintage laundry bag seemed the perfect fit for so many reasons. First, it was already hemmed, had grommets along the top edge, was nearly café curtain sized and let’s face it, I could not have come up with a better theme…right? Plus, the idea that someone hand embroidered this little bag, had hung it up over a door and tossed their unmentionables in there long ago was sort of intriguing. I say intriguing because the bag is so tiny. I think one or two shirts and pants could be stuffed in there along with the same amount of socks and undies. So, either the previous owner did laundry on a very regular basis, or they did not. Take a moment to consider….now let’s all be grossed out together. ha! I actually just think it’s cute. kind of neat, and the effort put in to making something so mundane, attractive is sweet. Once I decided this was the best idea evah (not really, but I was sort of excited to have a place outside of the fabric stash to hang this baby! ), I measured the space to see how much, if any, fabric I would need to add to make this a functional curtain. It turned out that I did need about 6 inches on each side to even things out and I found an old vintage dress in my stash with similar colors to the embroidered bits. The old dress was a gift from a friend many years ago, and although I did not wear it, I always held on to it for the fabric. 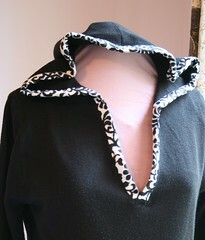 You see, the fabric is a crazy paisley design in dark brown, orange, yellow and pink. It reminds me of Neapolitan ice cream and Dunkin’ Donuts every time I look at it. (Probably not the best thing for someone trying to cut the sweets, but that’s another post altogether.) 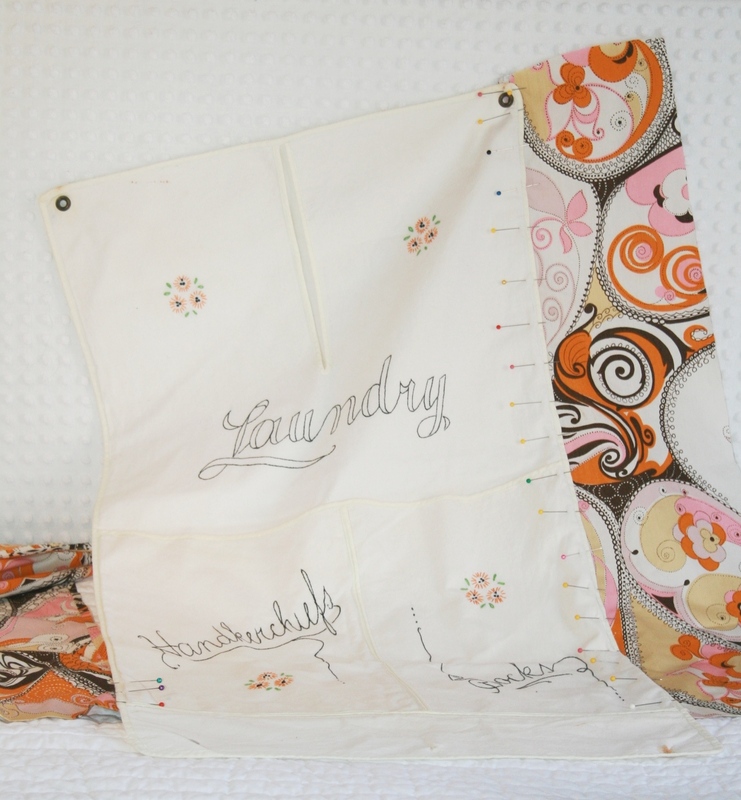 I thought it would be fun to pair up the dress fabric with the laundry bag since the little embroidered flowers were stitched in an orangey-yellow thread. I literally laid the laundry bag down next to the dress, matching up both of the hems, and used tailor’s chalk to mark the dress where it needed to be cut. It turned out that the panels of the dress were close to the exact size needed for each side of the laundry bag, so I simply cut two panels from the dress, keeping the hem in place. Because the laundry bag had a nice binding all along the edge I laid it on top of the dress panel and stitched a seam along the binding edge. After attaching both vintage dress fabric panels to the laundry bag I folded back the raw, cut edge of the dress fabric twice, enclosing the frayed portion and stitched it up with the machine. The laundry bag had another feature that worked to my advantage with this project. It had a flap with snaps along the bottom so that it could be emptied very easily. So, rather than sewing along the bottom edge, I just folded the flap, snapped it in place and hand stitched along the back side to make sure the flap stayed in place. Before folding over the top edge of the curtain to sew in a rod pocket I decided to hold it up to the window to get a feel for how much it would cover. The laundry bag is definitely longer than a standard café curtain and I was not sure it would look right once I got to this point. As I was holding it up to the window I noticed it was landing right at the same level as the shelf brackets attached on either side of the window casing. It was at this moment that I decided to take the “laundry” theme a step further. I attached a piece of clothesline between the shelf brackets and hung the “curtain” panel over the line with vintage push style clothespins. I know, a bit cutesy, but it works for now! After adding the café curtain I realized we were still plagued with the ugly builder’s blinds pulled tight at the top of the window. 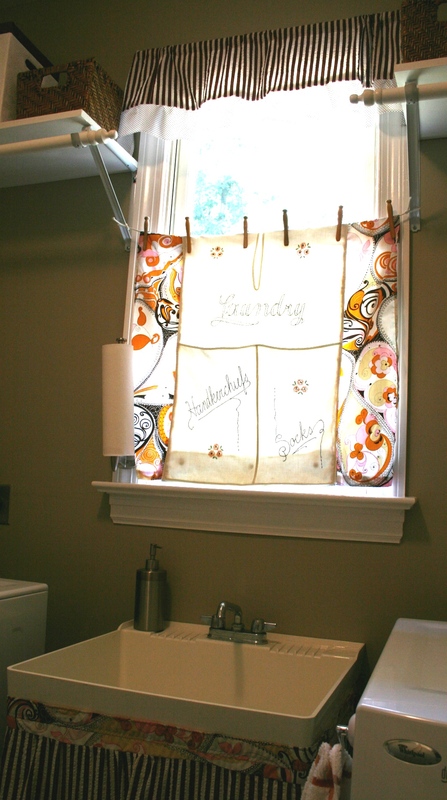 So, I used some coordinating fabric to create a simple valance to finish out the window treatment and to cover them up. The fabrics in the valance are vintage as well and actually match the tub skirt, which is another project I will be sharing later this week. Again, I measured the width of the window from outside edge of the casing to outside edge and then down enough to cover the blinds. 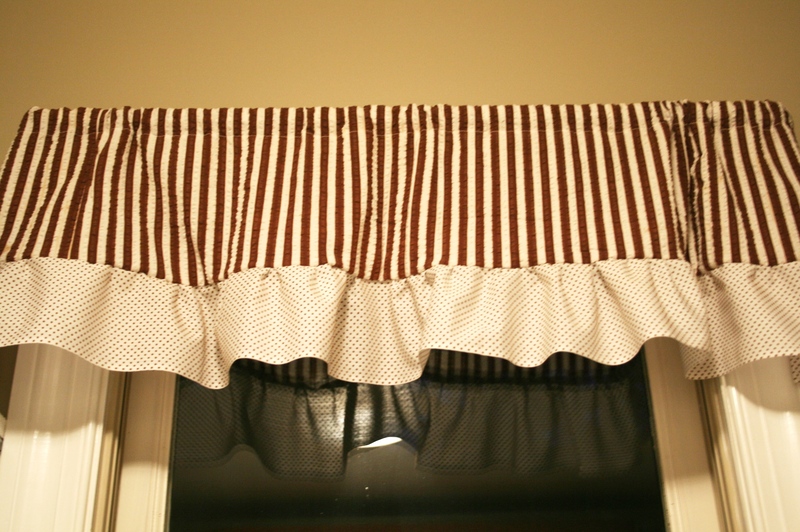 Because I did not want a really puffy, ruffled valance I did not double that width measurement. 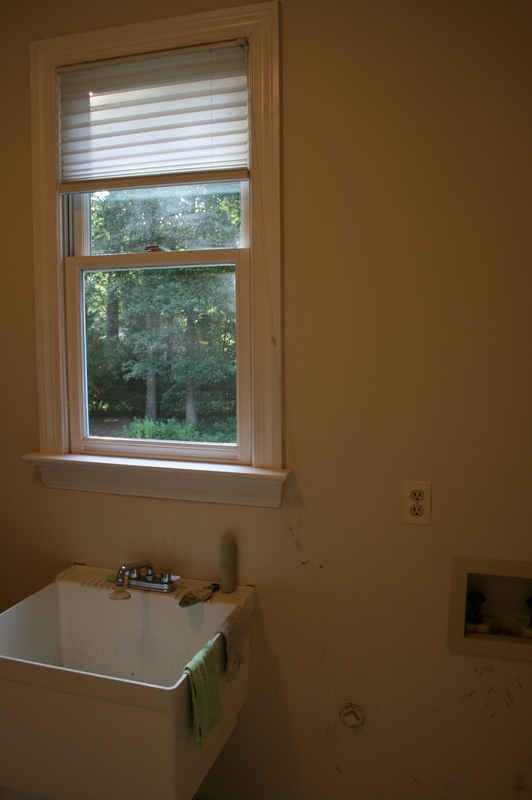 Instead I took it, plus one half the width (example: 20 inches across the window would mean 30 inches for the fabric width, or one and a half times the window width). I cut the fabric strips needed, stitched them together and pressed the seam. I also folded the top edge over about 1.5 inches and stitched it down along the backside to create a rod pocket. I was using leftover bits of fabric for this project, so it turned out that the bottom edge of the bottom strip of fabric was the bias edge, meaning it did not need to be hemmed. yeah! At this point, I attached the valance rod brackets to the window, slid the rod through the pocket in the valance and hung it in place. Then, I went back and rearranged the scrunching along the rod to even it out. An interesting, vintage laundry bag inspired creation. Stay tuned for a few more details about the tub skirt and the clothespin bag that I also made for this space.